IN THESE VIDEOS we see French police coming under Kalashnikov fire in Marseilles. The local people interviewed about this incident afterwards said it was nothing special; things like that happen almost every day. Some of the footage showed them just walking around normally as the shooting went on. Here, in a separate incident in another part of Marseille, we see a police car completely surrounded by moped-riding “jeunes” [young people]. They are intimidating the police. Marseilles is estimated to be about 40% Muslim now. “En France il n’y a plus une préfecture ou une sous-préfecture où il n’y ait pas 1 quartier chaud, 1 cité. 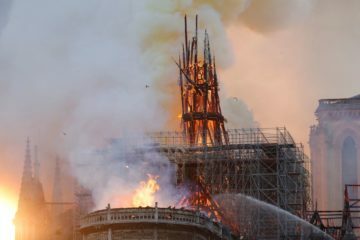 Laurent Obertone wrote a book called France: Clockwork Orange about the disintegration of public order and decency and the innumerable small eruptions of incivility and crime. In the course of writing his book, he made many contacts in the police. Here he relays a message he received from an anonymous member of the GIGN (police special forces units). Message just received, intended for my readers and more generally for the civil population. Share this warning massively. 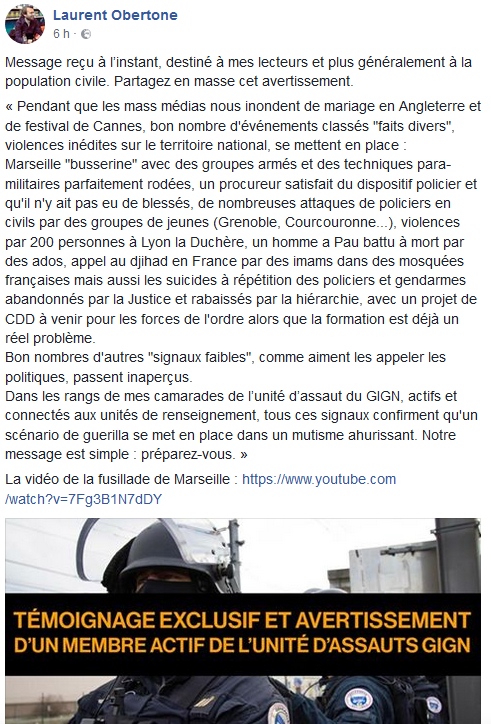 “While the mass media inundate us with the marriage in England and the Cannes festival, a large number of events described as “Miscellaneous news”, unheard-of violence on the national territory, are moving into place: Marseille “busserine” [the shooting incident shown above] with armed groups and paramilitary techniques perfectly executed, a prosecutor satisfied with the police deployment and that no one was injured, numerous attacks on police in civilian clothes by groups of “jeunes” (Grenoble, Courcouronne, etc. ), violence from 200 people in Lyon La Duchère, a man beaten to death by a group of teenagers in Pau, calls for jihad in France from imams in French mosques, but also repeated suicides of police and gendarmes abandoned by the Justice system and demeaned by the higher-ups with a fixed-duration contract project to come for the forces of order while training is still a real problem. A large number of “faint signs”, as the politicians like to call them, are passing unnoticed. If the last 175 years are an indication of France’s will to resist and martial prowess, I suspect it will soon be the first Western European caliphate. I hope to be proven wrong. Well France as the first european caliphate…?well, possible, but I think it will be the third may be the fourth actually. Great Britain, Germany and Sweden are much more contaminated than France ( well, I write from France you know), and I think that some secession will take place here. To try to simplify the process, let’s draw a line on the map of the country, which divides the country in two parts, from Bordeaux on the west, to the eastern frontier of the country. On the north of this line, the territory is extremely contaminated with islam, and especially the Paris area. On the south part of this virtual line, it’s better, but, there are some very contaminated cities, like Toulouse or Montpellier, and this could be a problem. Your hypothesis could be really verified in the north, but in the south it’s different. Even if the very contaminated places will have to be seriously cleaned, this kind of action is impossible in the north, and especially in the Paris area….too many invaders already implemented, with an extremely high rate of birth….the “natives” who will want to survive, will have to move, and a caliphate can emerge. Well, one thing is certain : France and also Britain, Sweden, Germany are in big big jeopardy, and another thing is certain too : people here in France are totally lobotomized ( believe me, I’m french and live here…), and are mostly unable to see the danger ! Anyway…vediamo as we say in italian ! But I’m not very optimistic, I’m sure you had understand it. My best vows to the National Vanguard team, it’s good to join your site regularly, and read some real news….by the way, you made just a little mistake about the person you quote : his name is Laurent Obertone, it’s a guy, as in french, Laurence is for girl’s name. but it’s not that important anyway. Adishatz, as we said in my South West, which means “bye”, to all readers of this site. A nonsensical generalization by an outsider. Thank you for the tutorial. I am grateful to hear your thoughts, especially as you are personally witnessing the events in question. 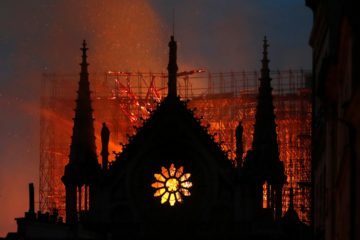 I wish you, and all the French people the best. Long Live Europe! George,thank you for your answer; I really appreciate your positive thoughts for my country, and the few people who try to act at their humble level, to open the eyes of millions of morons ( isn’t it ironic to confess that one’s fellow citizens are so dumb….? ), because unfortunately, french people are in many ways, like fragile lambs who lost their will to live ! What I described, is just an hypothesis actually, and I would say it’s the best thing that could happen : a secession, to preserve what can be still preserved, for some years, while the rest of the country will have to be abandoned, definitively lost, colonized by islam, with its legions of “dhimmis”, which is the term muslims use to talk about those who chose to submit to them ! But I’m not even sure it can take place….we heve no specific amendment in our constitution that says that an access to weapons is a fundamental right ! Here, our different governments for decades, made laws to deter us to even think of the possibility to have a gun ! Moreover, most of men here, are fragile little things you know, totally disconnected for what is a tough situation, where tough guys only, can emerge…. Anyway, vediamo as our italian cousins say…. Thank you again for your answer George, it’s a pleasure to talk to US citizens through this site, and it’s my turn to wish all the best, for you, your family and your country of course. You are my racial brother and I will always have the best interests of your people in my heart. Stay safe, stay in touch, continue to try to save your country. Don’t give up! 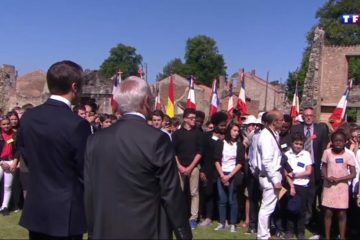 France has contributed a great deal to White Western civilization and should not be allowed to go quietly into “the good night” of servitude. Urge like-minded minded individuals to do whatever they can to resist the Muslims and don’t despair. Thank you George, your words go directly to my heart, and I mean it ! I’ll carry on working, as you say, hoping it will have some impact one day ! Reading your words really have my hope amplified, and you can’t imagine how important they are, with my natural trend to see things in black, to be pessimistic……it’s something I had noticed every time I visited your country : people have much more resources in the USA, that they have in Europe. I don’t know what the origin of this phenomenon, but it’s an obvious fact. I’ll keep in touch for sure, I’ll do my best at my humble level. Thinking that people like you are helping, just with their thoughts or payers, well, it sounds girly or childish, but I must confess it, it really really helps ! Thanks again George ! Take great care, and hope to exchange with you here soon. Adishatz, as we say in this old language named Occitan, that we used to talk here (some people carry on learning it those days), before we were colonized by those of the north, the bloody people of Paris and their “île de France”, who are now so politicaly correct and so fond of the muslims devils. Have a nice day George, and the best for the USA and real patriots like you ! Always linked in brotherhood. I have been thinking about your response to my last post. I ask you to consider joining the National Alliance. We are a vanguard organization that advocates for White people all over the world and we are dedicated to reversing the current trend towards the extinction of Europeans. Please look at our website and see if you want to be a part of our group. I sincerely believe that you will find our message appealing. Whether you join or not, you have friends in America who understand your plight and stand firmly with you. Our common interests, ancestry, and culture make us a nation without borders.